View this edition in our enhanced digital edition format with supporting visual insight and information. Thanks to this week’s contributors, Annie Koh and Esther Kong of Singapore Management University for providing a new perspective on how family business advisers can create trust and forge sustainable partnerships with the next generation. Their suggestion? The adviser should play the role of a Connector, Collaborator, and even a Co-Investor. Family entrepreneurship is key to growing the family business across generations. As the new generation rises to the occasion and takes on the challenges and mantles of the family businesses, it needs support in many ways. In particular, the next generation needs help in developing the entrepreneurial skills which will help further build the credibility in its companies. In an era of technological advances and increased connectivity, interdependence is prevalent, requiring both internal and external collaboration to deliver value with shorter turnaround time. How can family advisers help the next generation build holistic and long-term perspectives and value? By playing the role of a Connector, Collaborator and, at times, the Co-Investor, the adviser can build trust and forge sustainable partnerships with today’s next generation of family business leaders. We elaborate with three examples of how next generation members pursue their own dreams and ambitions, while at the same time, living up to the expectations and responsibilities of building sustainable family growth enterprises. We trust that the cases mentioned below will offer food for thought for family advisers to consider when taking on more value-added roles in these times of disruption. Entrepreneurship is key to ensuring sustainability in a family business. On the other hand, founders and owners of family businesses may be reluctant to take the passenger seat and let the next generation have a free hand in running a business that is built upon many years of hard work. The question to ask becomes one of cultivating the right environment for innovation and experimentation while containing the levels of risk. This could be done through a well-defined space and time period with safeguards put in place to mitigate any downside risk for the family firm. Let’s take PBA International as an example. PBA started in 1987 as a bearings and mechanical components trading company. When its CEO, Derrick Yap first joined the company 16 years ago, he was keen to ‘transform’ the trading business but faced resistance from his father and fellow employees given his youth and lack of experience. Determined to prove that he was not just a successor by name, Derrick convinced his father to let him manage the business, and he eventually successfully transformed the company’s Malaysian market business, supported only by a six-member team. Today Malaysia contributes to 30 percent of the PBA Group’s revenue. Having turned the Malaysian business portfolio around, Derrick had earned the respect of employees, partners, and customers. Under his leadership, PBA has today evolved into a global leader in robotics and automation solutions with more than 22 companies and 500 staff across 13 countries. Derrick is also the Singapore winner of the EY Entrepreneur of the Year Award – Diversified Engineering in 2017. Imagine the core family business as a mothership. Not everyone in the next generation of the family may agree about how the core business should be run. However, the next generation could leverage the mothership’s resources, reputation, and relationships and develop a viable offshoot to the core business. In fact, the new business could act as an extension of product or service offerings to enable the mothership to build family business sustainability. Mr. Arthur Chua is the CEO of Goldbell Group, Singapore’s market leader in distribution and leasing of industrial vehicles. Arthur began his career in Goldbell as a workshop operations executive in the Aftersales division where he started learning the ropes of the business. He rose through the ranks across various divisions and built his knowledge and experience in the Industrial Vehicle space before taking up the mantle of CEO. Under Arthur’s leadership, Goldbell has seen a 13% compounded annual growth rate of revenue over the last four years, achieving record highs year-on-year in the company’s 34th to 37th anniversaries. While ensuring paced growth of the core business, Arthur is also driving Goldbell’s vision to be at the forefront of mobility and innovation, and not for Goldbell to remain only as a leasing and distribution business. Arthur foresees the future of mobility in three pillars: sharing (economy), electric, and Autonomous; which he focuses his attention on. One such initiative is SWAT, which has been developed as an intelligent machine learning algorithm that uses spatiotemporal big data analytics and Internet of Things (IoT) to dynamically route vehicle assets to optimise asset utilisation. What does this mean to commuters? A future service that will have “Speed like Taxi, Price like Bus” (tagline of the new business). Every family is unique with its own strengths and challenges. Can business families support each other to develop and groom next generations for the sustainability of their respective businesses? This is definitely possible given that many successful business partnerships are built on trust, shared values, and a common purpose. The benefits from the mentor-mentee relationship are mutual as the process builds deeper understanding of each other’s business and hence develops greater trust. When Wilmar International Limited announced its joint venture with Myanmar-based Great Wall Food Stuff Industry Company Limited and its indirect wholly-owned subsidiary, Wilmar Sugar (Myanmar) Pte Ltd, to produce and sell sugar and its by-products, it also marked the beginning of the special relationship between the current generation of the Kuok Family with the next generation of the family behind Great Wall. The latter was able to learn best practices from Asia’s leading agribusiness group, which is not only among the top 10 global raw sugar producers but also the largest raw sugar producer and refiner and a leading merchandiser of consumer brands in sugar and sweetener market in Australia. With the above examples in mind, the advisers of the future can play the role of any of the three Cs (Connector, Collaborator and the Co-Investor) to align to the developmental needs of next generation leaders of family firms. Dymon Asia Capital offers a good illustration. A leading Asia-focused alternative investment management firm, Dymon Asia manages strategies across public and private markets in Asia and globally. A few years ago, Dymon Asia had invested in a company that was owned by a pair of siblings. Due to the challenges of the sector, particularly with increasing costs and stricter regulatory requirements, the sector was going through a consolidation process, and M&A was identified as a key strategy for growth. However, the shareholders were not familiar with the process of mergers and acquisitions (M&A). Dymon then worked with the shareholders to identify targets for acquisition, conducted negotiations and carried out due diligence work. Dymon also led the legal documentation discussion and the subsequent post-acquisition integration work. In addition to the M&A strategy, Dymon Asia also gave the firm guidance in institutionalising various corporate governance initiatives such as monthly board meetings, monthly and quarterly financial reporting, which the company had previously never carried out. Because of Dymon’s investment and involvement, core central office functions such as human resource, finance team, marketing and branding divisions, were set up to support the firm’s growth. Needless to say, the current business environment has changed from a decade ago. Family businesses can no longer remain competitive simply based on a strong balance sheet and established relationships with customers and partners. 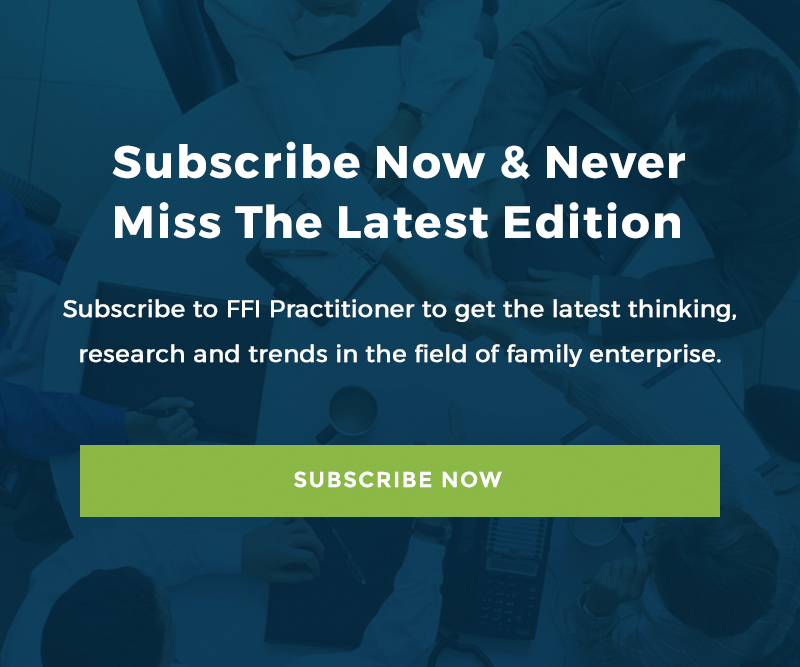 Neither can consultants, advisers, and investors not consider going beyond their traditional roles and adopting a holistic and long-term approach when working with business families. Family enterprises typically encounter challenges when innovating and designing a digital transformation strategy. This is where ecosystem support and partnerships come in handy to help these enterprises scale and grow. Collaboration builds innovation, develops competence, and increases capacity as it provides the platform for business families to share resources as well as learn from different partners who bring a range of skill-sets and knowledge. The advisers of the future can play a pivotal role in the process. They must embrace the ecosystem approach to thrive in their new role – as the Connector, Collaborator and Co-investor. Annie Koh is the vice president for business development and a professor of finance (practice) at the Singapore Management University (SMU). She is also the academic director of Business Families [email protected] and an FFI board member. Annie can be reached at [email protected]. Esther Kong, CFBA, is the deputy director of Business Families [email protected] She can be reached at [email protected]. Since 2010, the Singapore Management University (SMU) had recognized the emergence of Asian business families and discerned that they require specifically contextualized thought leadership and applied knowledge. In response to the growing needs of business families in Asia, SMU established the Business Families Institute (BFI) in August 2012. [email protected] collaborates with various partners, academic or practice, to be a leader in Asian business family-related knowledge. From Single Business to Portfolio of Businesses: When does the family business become a business family?